Is Halloween season and Dracula's Legend continues to fascinate people from all over the world, remaining one of the best entertainment attractions of this period. Dracula brand was created by the Irish writer Bram Stoker in his 1897 horror novel of the same name and represented a fictional character, perhaps the most famous vampire in fiction. Radu Florescu and Raymond McNally in 1972 wrote "In Search of Dracula" where discussed about the connection between Vlad Tepes and Dracula. Following them, Stoker did find the name Dracula in his reading on Romanian history and has based his story on the historic Wallachian ruler Vlad III, also known as Vlad Tepes , "Vlad the Impaler". Tales of the supernatural had been circulating in Romanian folklore for centuries, and many of them were inspired by real-life characters of national heroes. "Dracula" name is derived from a secret fraternal order of knights called the Order of the Dragon . "Dragon" in Romanian is "drac", derived from Latin "draco". Vlad II Dracul, "son of the Dragon" Mircea the Old, was admitted to this Order around 1431 because of his bravery. His son inherited his name and was named Vlad III Dracul (Vlad Tepes). Vlad "The Impaler" (1456– 1462) is a folk hero by Romanians history, brave and military strategist when fighting against invading Turks. Was famous also because was fair and have killed thousands of people for any acts of dishonesty in his attempts to maintain order, mainly by using the method of impaling them on a sharp pole. "When a man or lord is strong and powerful he can make peace whichever way he wishes yet, when he is weak, someone stronger will come onto him and submit him to his mercy." Vlad The Impaler's letter to the people of Brasov, on the 10th of September 1456 according to Nicolae Stoicescu in "Vlad Tepes" book from 1976. The character of Count Dracula has remained popular over the years, the total number of films that include a reference to Dracula may reach few hundreds movies, according to the Internet Movie Database, the most popular being Tod Browning's film "Dracula" from 1931 and Francis Ford Coppola's film "Dracula" from 1992 featured by 'Lovesong for a Vampire' by Annie Lennox and starring Gary Oldman and Winona Ryder. Like Frankenstein, Dracula has inspired many literary tributes or parodies and has been adapted for children's literature and entertainment, serving as the basis for several vampire cartoon characters over the years and few series of video games. Dracula became the most popular Romanian symbol abroad, and Romanians have accepted with difficulty the connection between Vlad Tepes and the most popular vampire monster, but nowadays there are few touristic sites in Romania that are associated with his name. In the Sighisoara Town tourists can visit the house in which Vlad was born, now hosting a restaurant and a small museum of medieval weapons. 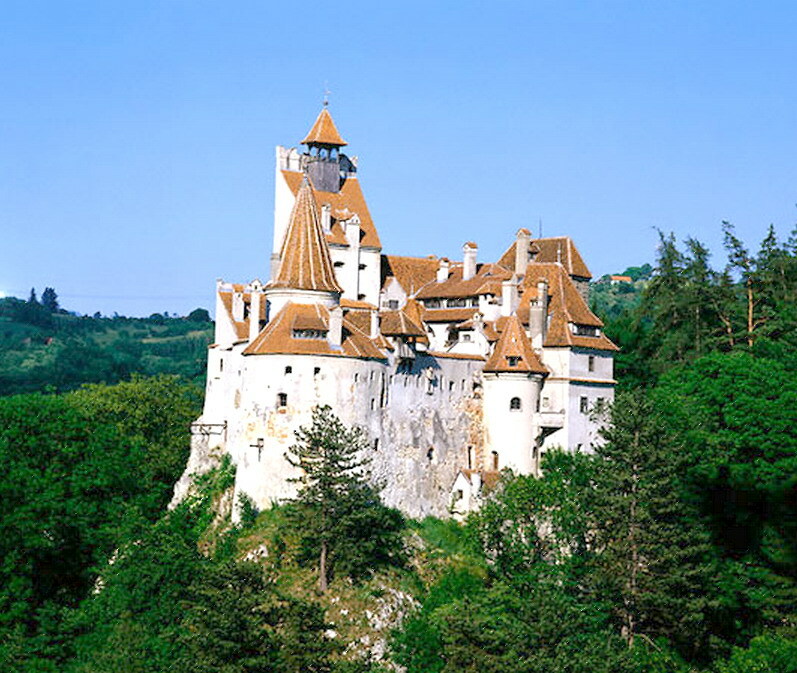 Bran Castle, an important Romanian monument, is said that was owned by the Dracula and is promoted as "Dracula's Castle", even Vlad Tepes had only a tangential connection with it. Bran Castle was built by Braşov Saxons in 1382 and made a role of defender against the Turkish invasion when Vlad Ţepeş was beating a retreat through the Transylvanian countryside but this was not his home, he only may lived for a very short time and only as a guest. Is situated 30 km from Brasov, between the Bucegi Mountains and Piatra Craiului, and this region inspired "The Carpatian Castle" written by Jules Verne. The real place where Vlad Tepes has lived is Poenari Citadel (Cetatea Poenari in Romanian) on the Arges River valley, close to the Fagaras Mountains. This ruined castle stands on a cliff, on the right side of the Transfagarasan Road which climbs into the Fagaras Mountains. 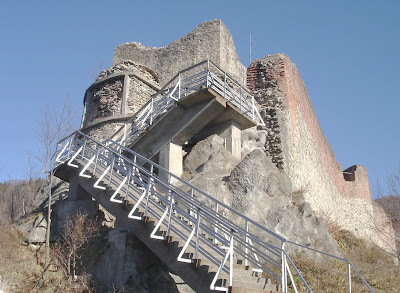 Initial the main citadel of the Basarab rulers from Wallachia, Poenari Castle was repaired and consolidated by Vlad The Impaler who making it one of his main fortresses. Abandoned and left in ruins, the walls and its towers still stand today and to reach it visitors need to climb 1,500 steps. Other sites where he lived for a while are The Old Princely Court (Palatul Curtea veche) in Bucharest and Snagov Monastery where, according to legend, his remains were buried. Forget Dracula, those castles are gorgeous! Following you from Friendly Friday, pls. follow back! Beautiul Castles. Thanks for the tour. I am a new follower from Boost My Blog Friday. I would appreciate it if you could stop over and follow back. Hi- Love the castles--I found you on a friday Blog hop- Please come by and check out my blog and hope you follow too. I had no idea. That is too cool. Thanks for sharing. I'd love to see that castle in person someday. Fascinating. I love the melding of legend and history. Thank you for your lovely words - I hope you will enjoy my other topics exploring my blog, too.